One of the most familiar Bible stories is that of Yeshua (Jesus) feeding the five thousand. This amazing and encouraging story is the only one of Messiah’s miracles recorded in all four gospels. Since all four gospel writers deemed this event significant, there must be some deeper meaning to it than is apparent in a casual reading. Yeshua demonstrated His compassion and ability to meet human needs, but He also taught His disciples a valuable lesson in faith and in doing the will of God. By satisfying the hunger of 5,000 men and the women and children with them, Yeshua brought the Kingdom of God into their midst in ways none of them had experienced before, and He did so in a demonstration of Holy Spirit power. What more could there be to the feeding of the five thousand than this? Much indeed. In this one miracle, Yeshua provided a sign of His Messiahship, a teaching on the seven thousand year plan of God, and a prophecy about the end of this age. Two things of note in Mark’s version of the story are his attention to numbers and his care in telling us what happened separately to the loaves and to the fish. These are important details that a casual reader would miss. Mark specifies that the cost of feeding the crowd would be more than two hundred denarii, and then tells us twice that there are five loaves and three times that there are two fish. He also notes that Yeshua gave the bread to the disciples to distribute, but that Yeshua Himself distributed the fish. 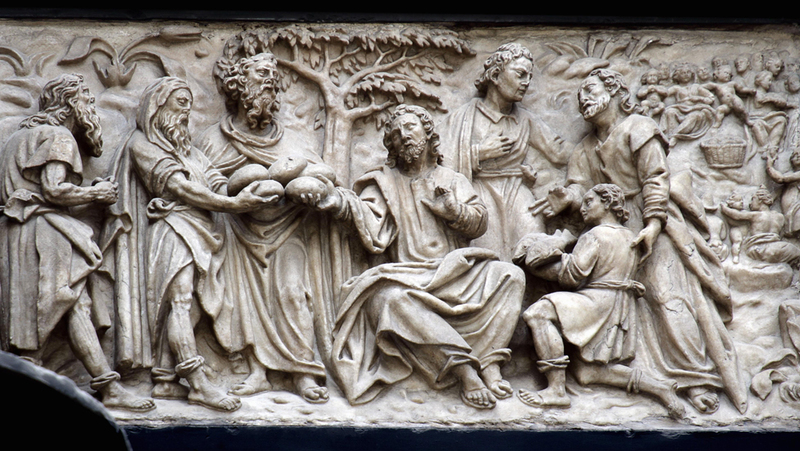 Finally, Mark explains that those who ate of the loaves (not the fish) were about five thousand men, and that the disciples took up twelve baskets of fragments of the bread in addition to the remains of the fish. What does all this mean? The answer comes by looking at the passage with Hebraic eyes to discern the lessons that our Hebrew Messiah was teaching His Hebrew followers. Hebrew, like many other ancient languages, assigns meanings and numerical values to letters. Those meanings and values impart a more complete picture of God’s intent in both the Hebrew and Greek scriptures. In this story of feeding the five thousand, the first number we encounter is two hundred, when the disciples tell Yeshua that not even two hundred denarii worth of bread would be enough to feed the people. The numbers in question are two and its multiple, two hundred. Two is the value assigned to Bet (ב), the second letter of the Hebrew aleph bet (alphabet). Two means division or difference, and on the highest level refers to the balance or interaction between God and man. The meaning of Bet is “house”. When a man builds a house, he first takes a wife so he can have children by her. God showed us this by example. We know that the Son of God, Messiah Yeshua, has a Bride, and that through Him come sons of God, saved by grace through faith in Yeshua (Isaiah 62:5; John 3:29; Revelation 21:9; Hosea 1:10; Romans 8:14-19; Galatians 3:26, 4:1-6; Ephesians 2:8-9). There is an ancient Hebrew teaching explaining how this is expressed in the very first letter of the Bible, an enlarged Bet in the word beresheet (בְּרֵאשִׁית), translated “In the beginning”. The number two hundred equates to the letter Resh (ר), which means “person, highest”. In scripture this number often indicates insufficiency, and in this instance it means that the best the disciples could offer would be insufficient to feed the crowd. Thus from the start we understand that Yeshua will be teaching something about the interaction of God with humans, specifically how God will bridge the gap where the insufficiency of human means falls short of the need. The next numbers we encounter are five (loaves of bread) and two (fish), which together make seven. Both food items are associated with Yeshua. He identified Himself as the Bread of Life (John 5:22-58; Matthew 26:26; Mark 14:22; Luke 22:19; I Corinthians 11:24), so the connection with the bread provided to the hungry multitude is easy to see. The connection with the fish is something we shall cover shortly. For now it is important to note that the seven items given to feed the people show something about the seven thousand year plan of God. Five of these thousand year “Days” are periods when God works exclusively through humans to achieve His intent, but on the other two “Days” God personally intervenes in human affairs, first to redeem and then to restore His creation. Those are the two comings of Messiah. Yeshua came the first time at the end of the fourth millennium after creation to take all the sin of the world on Himself and die as the perfect sacrifice. As God’s Passover Lamb, Yeshua accomplished the work of redemption from the curse of the law of sin and death (Genesis 22:8; John 1:29; Romans 6:1-14). Then He returned to His Father in heaven. There He waits until the dawn of the Seventh Day, when He will return as King of Kings to judge and rule the nations and repair the ravages of six millennia of sin (Isaiah 1:24-26, 44:21-28, 49:1-13; Jeremiah 16:14-21; Ezekiel 20:33-38, 29:21-29; Micah 2:12-13; Zechariah 9:11-17; Revelation 19:11-16). As a sign of this great plan, Yeshua had his disciples distribute the fives loaves, but He Himself distributed the two fish. The meaning is this: in five of the seven Days, God’s servants deliver the Bread of Life that He has provided through His Word, meaning specifically the written Word recorded by Moses, the Prophets, and the Apostles (Psalm 68:11), but in the Fourth and Seventh Days, Messiah Himself will deliver nourishment since He is the Living Word of God (Isaiah 2:3; Micah 4:2; John 1:1-16). A common Christian teaching is that “jot” refers to the letter Yod (י), the smallest Hebrew letter, or to Iota (ι), the smallest Greek letter, and that a “tittle” is the smallest stroke of a letter. That is not correct. Jots and tittles are special Hebrew scribal marks intentionally inserted in the text to convey a specific meaning. They are considered part of the scripture, a fact that Yeshua confirms by His statement in Matthew 5. Sadly, Christian translators have ignored these marks for the last two thousand years largely because they have no understanding of what they mean and no way to translate them. Jots are simply dots placed over a particular word, such as the six dots appearing over the word “kissed” in Genesis 33:4. Those dots are said to represent the teeth of Esau, who, although he seemed to be reconciled with his brother Jacob, really wanted to bite into Jacob’s neck and kill him. That is a prophetic picture of the strife between the descendants of Jacob and Esau down to the present day with the conflict between the State of Israel and the Palestinian Arabs. Tittles are special markings in the text, such as letters made larger or smaller than normal, bolded letters, gaps in the text, and letters drawn in strange ways. One example already mentioned is the enlarged Bet in the first word of the Bible, word beresheet (בְּרֵאשִׁית), which conveys the meaning that God intends to build a house on the earth by taking a wife and having children among mankind. The tittle that has specific meaning to the story of the five loaves and two fish is the Inverted Nun. Nun (pronounced noon), the Hebrew letter that corresponds with the English N, normally is written like this: נ. The picture Nun presents is a fish getting ready to dart away. Fish tend to surprise us by their presence. Often we do not see them in the water until they jump and splash, or swim away very quickly. This surprise reminds us that there is life out in the water, and for that reason the Nun means not only “fish”, but the quickening of life. Jewish teaching is that these two verses, set apart by these tittles, transform the five books of Moses into the Seven Pillars of Wisdom (Proverbs 9:1). In other words, the wisdom in Numbers 10:35-36 equals the wisdom in Genesis, Exodus, Leviticus, Deuteronomy, and the rest of the book of Numbers. They stand apart, splitting Numbers into three distinct sections which, when added to the other four books of Moses, create the Seven Pillars of Wisdom. 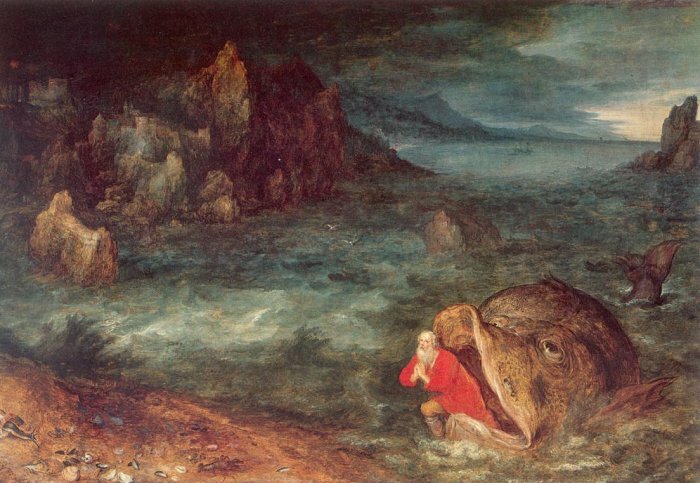 Jonah’s prayer is prophetic, telling us what will happen to Messiah when He is sacrificed to take away our sin and suffers in the depths of hell (Sheol) until His resurrection. This is the “sign of Jonah”, which Yeshua said would be the sign given to prove that He is Messiah (Matthew 12:39-42, 16:4; Luke 11:29-32). Through Jonah we have a powerful connection of Messiah Yeshua and His work of atoning death and resurrection to the Inverted Nun, and to the letter Nun itself. This is the Hebraic origin of the fish symbol common in Christianity to this day. The disciples estimated 200 denarii would not be enough to feed the multitude. This tells us that the lesson is about God’s interaction with mankind, and that His provision more than satisfies the need when man’s best efforts prove insufficient. The seven elements of food (five loaves and two fish) remind us of the seven “Days” (7,000 years) of God’s plan to redeem and restore His creation. The five loaves are the Bread of Life, broken for our sakes and distributed by the servants of God. For five of the seven Days of God’s plan, humans are responsible for distributing this Bread, which is the Word of God (Deuteronomy 8:3; Matthew 4:4; Luke 4:4). The two fish call our attention to the work of Messiah on the Fourth and Seventh Days of God’s plan. Fish, pictured in the Hebrew letter Nun (נ), remind us of life. The Inverted Nuns of the Numbers 10:35-36 and Psalm 107:23-28, 40 speak to the quickening of life and resurrection from the dead promised by God. This is the work of Messiah. On the Fourth Day He died for the sins of the world, rising from the grave three days later, completing the sign of Jonah and scattering His enemies. On the Seventh Day, Messiah will return to impart resurrection to all Israel and establish his Kingdom forever. Only God (Messiah) can do this, and that is why only Yeshua distributed the fish to the multitude. The disciples gathered twelve baskets of fragments from the bread. When the Twelve Tribes of Israel are restored, they will bring with them an uncountable multitude into the Kingdom (see Revelation 7, especially verses 9-10). There is even more to the feeding of the five thousand, and to Yeshua’s many other miracles and parables, which we have yet to understand. For example, Mark records that, “those who had eaten the loaves were about five thousand men” (Mark 6:44). Does that mean that even though the whole multitude ate of the bread, not all of them ate of the fish? If they did not eat the fish, what does that signify? Do they start on the journey of life in Messiah, but not finish? Do they have a lesser status in the Kingdom than those who ate the fish from Messiah’s hand? Should we be encouraged or disturbed by this detail? It will take more prayer and study to answer these questions and the many more questions they will generate. That is the Hebrew way of learning, a joyful and fulfilling method that God’s people have often missed. The Christian approach to scripture reflects the Greek and Latin methods of the Church Fathers, which do not take enough account of the Hebraic methods of Moses, the prophets, the apostles, and Messiah Himself. We miss much knowledge, understanding, and wisdom by ignoring the Hebrew roots of God’s Word because they are too “Jewish”. Yet Jews also miss the full picture, for even though to them are given the oracles of God and much more (Romans 3:1-2, 9:1-5), rabbinical Judaism rejects Yeshua of Nazareth as Messiah and therefore does not understand how He fulfilled the work of redemption and will soon fulfill the work of restoration. Thus “blindness in part has happened to Israel” (Romans 11:25), both the Jewish and non-Jewish parts of Israel. God promises to address these blind spots so that “all Israel will be saved”. Let us pray for this day and see if perhaps we may hasten its coming. The name Jesus is the English rendition of Messiah’s Hebrew name, Yeshua, which means “Salvation”. His title, Messiah (Anointed One), is translated into English as “Christ”. My preference is to refer to our Savior as Messiah Yeshua, but I will be quoting from the New King James Version of the Bible, which refers to Him as Jesus Christ. The Apostolic Writings (New Testament) are in Greek, but the events they record, particularly in the Gospels, occurred in a Hebrew or Aramaic setting. Yeshua as a first century Jew lived in a Hebraic culture and most certainly taught His disciples in Hebrew and in Aramaic. It is not only logical, but essential, to approach His teachings and those of the Apostles from a Hebraic perspective. E. W. Bullinger, Number in Scripture: Its Supernatural Design and Spiritual Significance, 4th Ed., Rev. London, Eyre & Spottiswoode (Bible Warehouse) Ltd., 1921, p. 83. Monte W. Judah, “Heritage of Abraham: Foundations of the Faith Presentation Materials”, Lesson 4, Lion and Lamb Ministries, Norman, OK, 2009. Monte W. Judah, “The Jots and Tittles of Moses”, in YAVOH, He Is Coming, Lion and Lamb Ministries, Norman, OK, July 2004, http://lionlamb.net/v3/YAVOH-HeisComing/2004/07. Ibid, p. 140; Judah, “Heritage of Abraham”. The following chart is reproduced, with some modification, from Monte Judah, “Heritage of Abraham”. Light, Darkness Adam created. Told if he sinned he would die in that day (he lived 930 years). Lights in the Heavens Kings, Prophets, those who show the things of God, regarded as lights in the heavens (Daniel 12:3). Living Creatures Messiah’s first coming (at the end of the Fourth Day, beginning of the Fifth Day) to make us new living creatures. Man Man to fill the earth and subdue it. Sabbath The Last (Seventh) Day. Messiah returns to judge the nations and rule from Jerusalem. Detailed teachings on Messiah’s two comings on the Fourth and Seventh Days are available through 119 Ministries at http://119ministries.com/brit-hadasha-series-part-2-4th-and-7th-day-part-1 and http://119ministries.com/brit-hadasha-series-part-2-4th-and-7th-day-part-2. Judah, “Jots and Tittles”. “Small and Large Letters”, The Jewish Encyclopedia, vol 11, pp. 411-412. Judah, “Jots and Tittles”. The Jewish Encyclopedia, “Inverted Letters”, vol. 8, p. 368, http://www.jewishencyclopedia.com/search?utf8=%E2%9C%93&keywords=v8+p368&commit=search. For a recent Jewish teaching on the Inverted Nuns, see Rabbi Aaron L. Raskin, Chabad of Brooklyn Heights, “The Upside Down Letter Nun”, http://www.chabad.org/multimedia/media_cdo/aid/1874450/jewish/The-Upside-Down-Letter-Nun.htm. “Church”, is a rendition of the Greek word ekklesia (ἐκκλησία; Strongs #G1577), the congregation or assembly of God. Ekklesia corresponds to the Hebrew qahal (קָהַל; Strongs #H6950), a term used throughout the Tanakh (Old Testament) to refer to the congregation or assembly of Israel. God’s purpose since the days of Abraham has been to establish a way for all the nations of the earth to be brought into fellowship with Himself through the nation of Israel. From the beginning, the purpose of the nation of Israel was to be a “kingdom of priests” (Exodus 19:6), the vehicle of salvation for all nations. © Albert J. McCarn and The Barking Fox Blog, 2014. Permission to use and/or duplicate original material on The Barking Fox Blog is granted, provided that full and clear credit is given to Albert J. McCarn and The Barking Fox Blog with appropriate and specific direction to the original content. Great teaching Al, I love the depth and the meaning that is uncovered from understanding the context! Thanks, Brandon. You’ve been putting up some good things yourself over at EsseRealis! I appreciate those hard questions you’ve posed over the last few days. They are the kind of questions Abba’s people need to keep on asking until we are walking in accordance with the answers He reveals through His Word. I can not hear or read about Jonah without thinking of these two GREAT videos! It was you who introduced me to Stu Lowndes’ work. Thanks for adding these videos. They are really good!